Want to teach your co-workers CPR, work for a CPR training organization, or deepen your understanding of the skill? A CPR instructor course may be for you. Here are a few tips for making the leap from CPR certified to CPR instructor. There are literally hundreds of organizations that offer certification in CPR. Because the government does not regulate CPR training programs, these programs have a lot of leeway to determine how they provide training—and not every certification program is created equally. The most well known names in CPR instruction are the American Heart Association, the American Red Cross, and the National Safety Council. The American Heart Association provides guidelines that a wide range of CPR training schools use, including this one. We suggest choosing a school that has real medical professionals doing the training, a solid record of employee acceptance and recognition, and an AHA-aligned curriculum. If you want to teach more than adult CPR, you will need different kinds of certifications for every skill you want to teach—including infant and child CPR, basic First Aid, Basic Life Support classes, Bloodborne Pathogens, and more. Every organization’s pre-requisites for accepting candidates into instructor CPR classes are different, and each instructor CPR program varies a bit depending on the school. It is usually simplest to get CPR certified with the same organization you plan to take the CPR instructor class from. These courses will take different forms depending on where you are taking the course. For example, the American Heart Association actually offers a series of courses covering various aspects of CPR as well as teaching pedagogy, both hands-on and in the classroom. 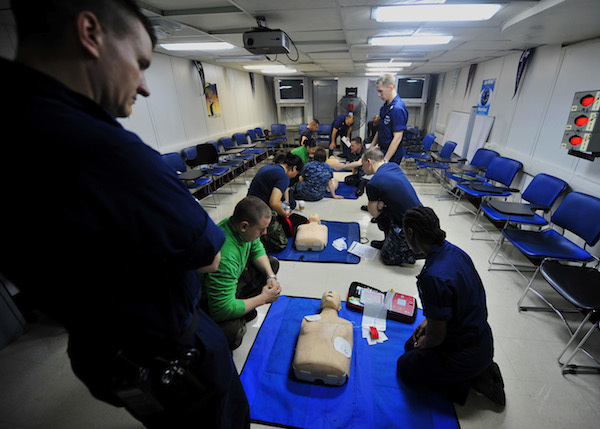 Schools might have different entry requirements, as well; for example, the American Red Cross requires prospective students to pass a pre-qualification exam before entering into CPR instructor training. Generally, the organization where you learn CPR will assume you are working independently—and may send you the materials you need to teach classes. If you aren’t sure, contact your school to see what materials they provide at the end of the instruction process, or whether they can be bought at a discount. Some organizations will actually monitor you before giving you a permanent or long-term certification—for example, the American Heart Association will do this—within approximately six months after you complete your instructor training program. You will be evaluated teaching a class to make sure you have the appropriate skills to impart CPR knowledge, both in the classroom and during practical application sessions. Find a job. There are a wide range of ways to find work as a CPR instructor. Some people get certified as CPR instructors because the job they already have has begun requiring them to lead CPR training sessions at work. Other people work as EMT’s, firefighters, and in other positions where teaching CPR is part of the job. If you want to work independently as a CPR instructor, however, you could do this in a variety of ways. Some people start freelance businesses providing CPR instruction in schools, corporations, and other organizations—as well as individuals who need to know CPR, such as new parents, personal trainers, dentists, and so on. Others work for training programs and schools, hospitals, nonprofits, and community organizations that provide free or low-cost CPR training programs to the public. Your CPR instructor certification won’t last forever—so be sure to get recertified. For some types of certifications, you are only eligible to recertify if you taught at least one class in CPR during the period where you held your certification—so be sure to check the fine print. Most organizations, including the American Heart Association, require you to pass an exam to earn your recertification. You don’t need a high school diploma. At least, you don’t need a high school diploma or GED to get certified in CPR and then to earn your instructor’s certification. However, different employers may have different requirements; these are more likely to require a high school degree or GED than a college degree for a CPR teaching position. Getting certified in CPR can take as little time as a few hours or as much as a weekend, depending on the type of CPR you’re learning and where you’re studying. The instructor course may require several different classes over a period of weeks, and study periods do vary depending on the organization—but getting certified as a CPR instructor is not a terribly onerous process. Many organizations let you take at least some of the training online, although some may have hands-on components and for some organizations, you will be required to undergo observation in a teaching environment. Becoming a CPR instructor doesn’t have to be expensive. The cost will vary and may range in the hundreds of dollars depending on the program you choose. But it’s a lot cheaper than college tuition. Fees may also apply for getting recertified, and you will most likely have to pay for recertification training and tests—but if you’re already employed and plan to teach CPR on the job, your employer may pick up the tab. You don’t need a job. Many people take CPR instructor classes because they are required to hold the certification by their employer, but you don’t have to go through a company in order to take the classes. Anyone can take them, even if you’re an aspiring instructor rather than a working one. Getting certified as a CPR instructor isn’t easy—but it’s a worthwhile endeavor, especially if it will help you get a new job or advance in the one you have. Get CPR certified first, then move on to an instructor training program that works for your schedule and budget—and that your employer or prospective employer will accept. Be thorough in researching training programs, and you’re most likely to find the one that’s right for you.